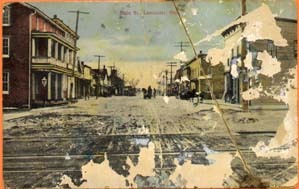 The 2nd building on the right is where the present Berrigans Pub/Hotel now stands. On the left the 1st building could be McRaes Hall, the spot which is today  Pat St. Pierre's garage, Shell Station. This photo is from Rhoda's files & is copyrighted by her. 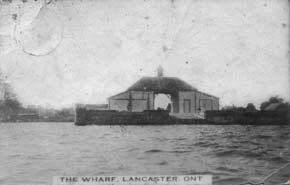 This is a photo, also from a postcard of the Wharf at South Lancaster as it looked in the earlier part of this present century, early 1900's.